Unparalleled beauty encompassing 5 acres in Waialua offering stunning ocean and mountain views. All the best elements of stone, steel, glass and water combine to make a perfect retreat for the most discerning buyer. This contemporary masterpiece centered amidst lush tropical grounds in the gated North Shore community. Expansive, elevated views everywhere from this secluded paradise surrounded by mature fruit trees. No expense has been spared in the designing and building of this masterpiece. The newly finished main property offers 4 enormous bedrooms with ensuite’s in each room all centered around the in ground pool. The additional property has 2 more bedrooms and a bathroom boasting old Hawaiian charm. On par with the finest Miami, LA, NY properties offering complete security & privacy. Please, send me more information on this property: MLS# 201822770 – $11,000,000 – 65-277 Poamoho Place, Waialua, HI 96791. 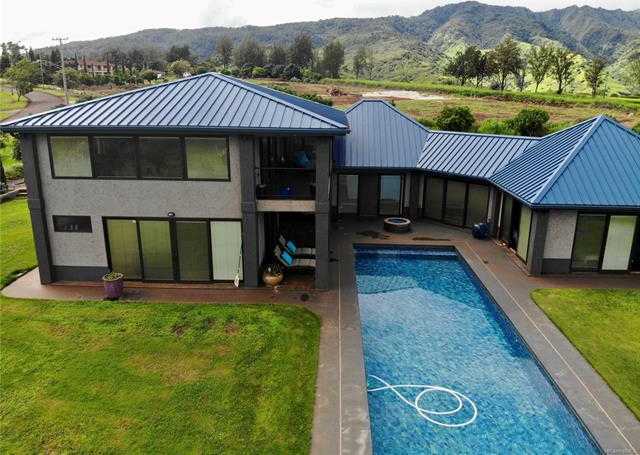 I would like to schedule a showing appointment for this property: MLS# 201822770 – $11,000,000 – 65-277 Poamoho Place, Waialua, HI 96791.